Logging in from the web on a PC or Mac at this site. When you are in the portal, click on the 'Reports' icon at the top to access the reporting features. Select the type of report you would like to create from the left navigation. Select the report you'd like to run, set a date range if applicable, and click Create Report. Details on the various reports can be found below. The sales summary report will give a breakdown of gross taxable and non-taxable sales. It will also provide total net sales, total net tendered and breakdown of sales by payment type. A Sales by Hour Report in the date range selected will give you the average sales amount, net sales for that time frame and what percentage of total net sales were from this time frame. This would be useful for determining what hours of operation are busiest (or least busy) and generate the most (or least) sales. 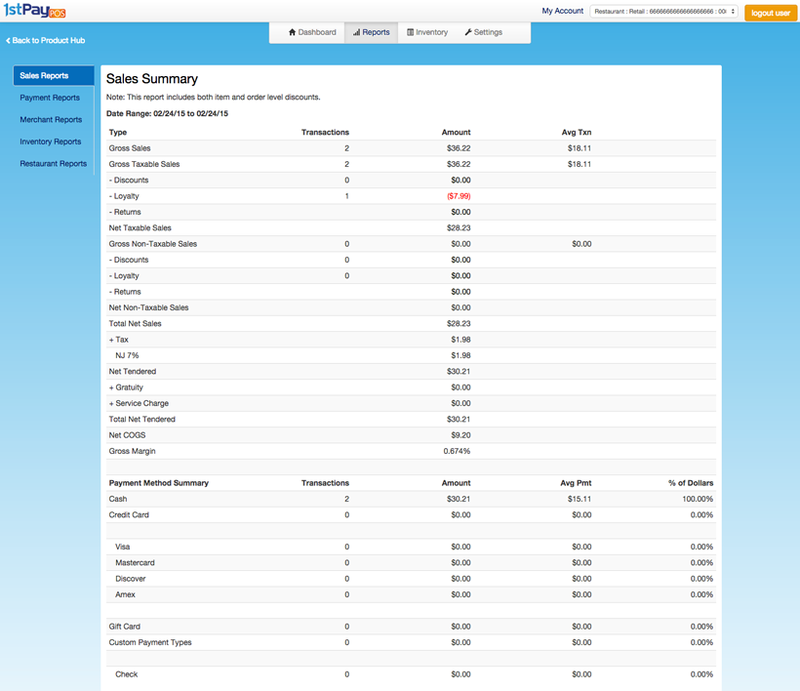 An Items Sold Summary report will give a breakdown of sales stats per item of inventory. Noteworthy information in these reports would be "% Items Sold", "% Sales", and "% Revenue" which would give an idea how popular an item is for customers of your business. 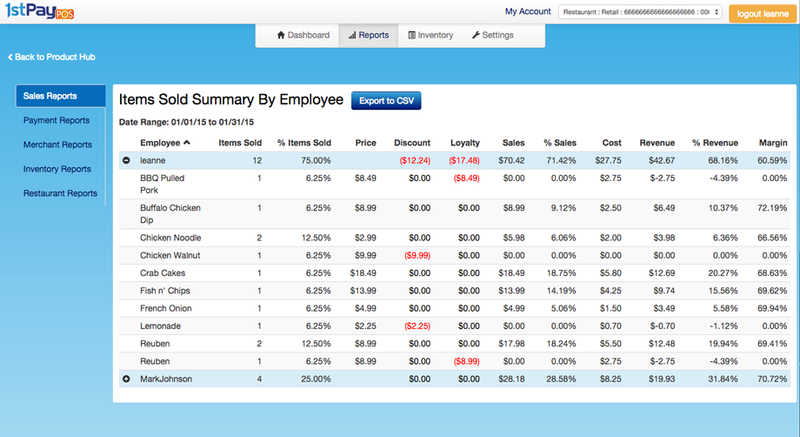 There is also the option to do a report of "Items Sold by Employee" and "Items Sold by Category", which instead of breaking down this information by item, these reports would break down information by employees doing sales or by categories in the inventory. This would be helpful to see if there are particular groups of items that are popular/unpopular, or which employees are making the most sales. If you choose an "Items Sold by Category" report, all items with no category and/or Misc. Sales will be accounted for under "No Category". A Payment summary report gives an 'at-a-glance' look at what types of payment make up sales for the date range specified. The pie chart only displays payment options that were used in the date range that was set for the report; if a payment type wasn't used, it will not be present. A Payment detail report will give a breakdown, order by order, of what kind of payment type was made for that order. It will also display any memos for the order (either when placing the order or making the payment) if they are present. A sales tax report can be run on the tax rates that are currently added in the portal. It will report the dollar amount of all the sales that have been able to be taxed, and the actual dollar amount of sales tax that has been collected to-date. A refund report can be ran to see how many refunds have been issued in the date range selected. The report will specify when the refund was issued, which employee (user account) issued the refund, what order the refund was issued for, and details about the payment type of the refund (which would be the same as the original order). Refund date/time is displayed for refunds issued 2/01/2015 and later. The employee that issued the refund is displayed for refunds issued 2/01/2015 and later. A discount report would give a breakdown of the orders in the date range selected to show which ones had discounts applied. The report will display which employee placed the order, the order ID, and which of the available discounts were applied. Z-Reports are the most crucial of the available merchant reports. When an employee is ending their shift, or a business is ending their day, they must run a z-report so that they have a record of what they are closing with. After selecting a date range, you will be prompted to select a zreport based on the iPads used on the account, and by employee. 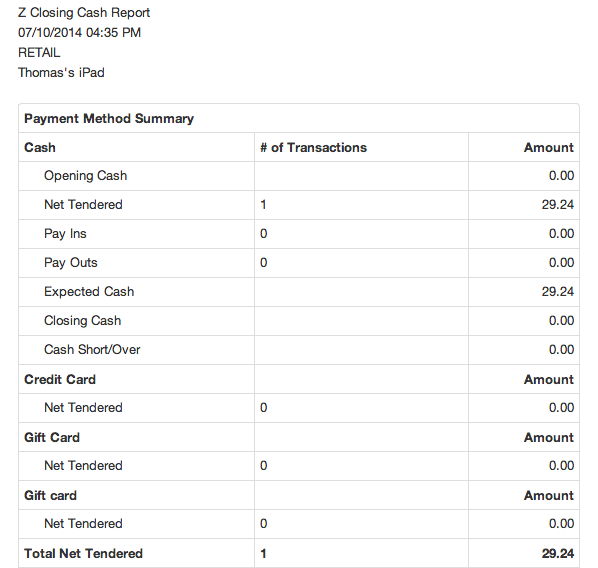 Z-reports will give a breakdown of payment methods, card types used, actions performed by the employee ("Cashier" in the report), tips the employee accumulated, and taxes collected for the window of time the employee was logged in. To read more about Z-Reports in the app, see here. This report does not require a date range. An inventory detail report will give a more thorough breakdown of the inventory in the portal. It will report the information about the settings on the items. Noteworthy in this report are "Value of Inventory at Cost" and "Value of Inventory at Retail" which would be a good way to quickly determine how much your items on hand are worth. A Categories Detail report is a good way to quickly determine how items are distributed between your categories set in the 1stPayPOS Portal. 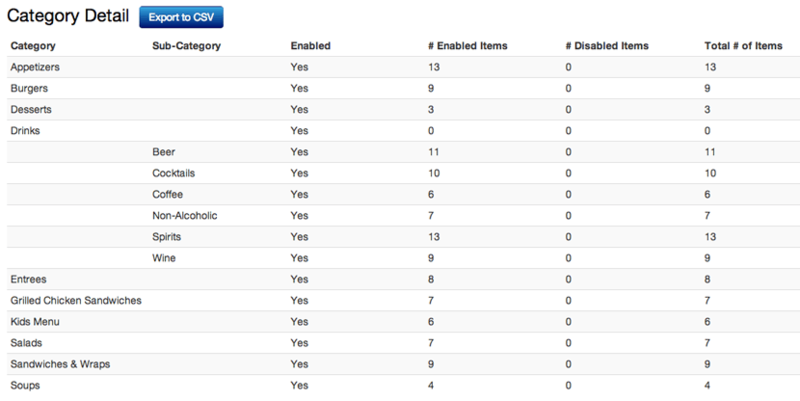 If not all items are enabled in inventory, this report would also be useful to determine where enabled and disabled items are located within categories. NOTE: Restaurant Reports are only available to MIDs that that have Restaurant set as their Industry Type. 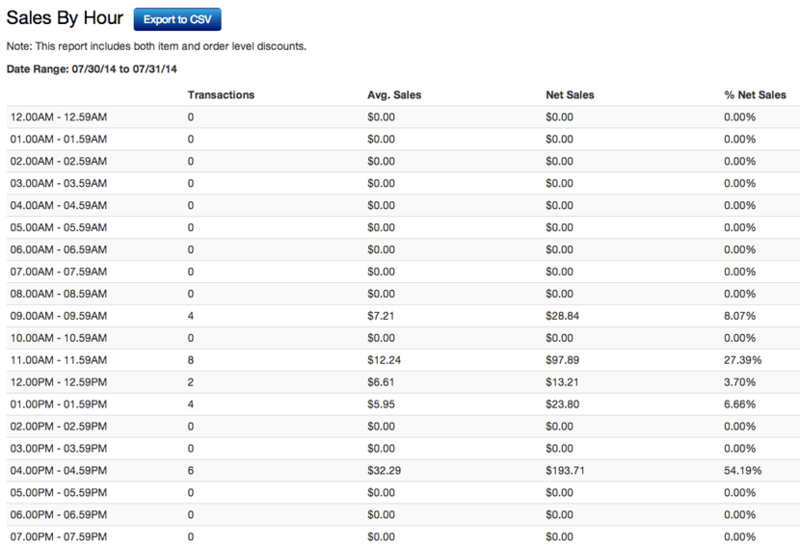 The Sales Summary by Category report displays how many items in each category were sold for a given date range, broken down by each 1stPayPOS user. This helps determine which servers are selling more or less of particular categories. 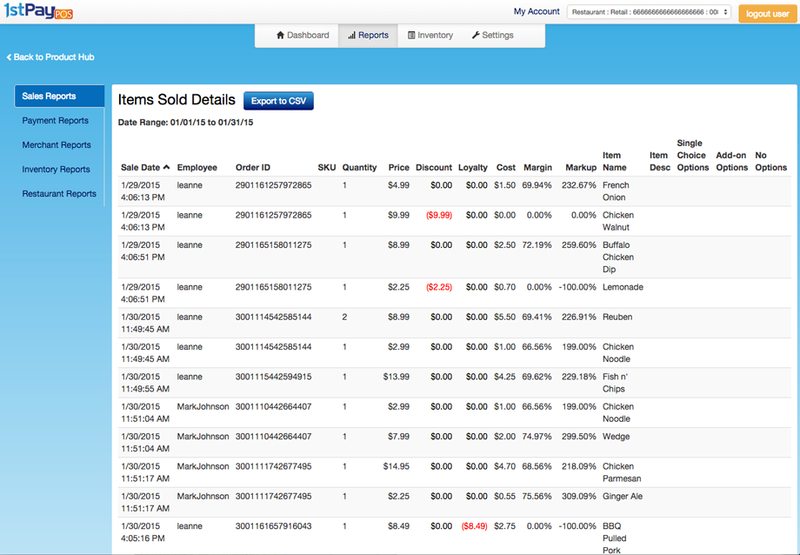 It also provides discounts, returns, net sales, gratuity, tax, and total net information for that user or server.